I worked on my witch hat all during the retreat. 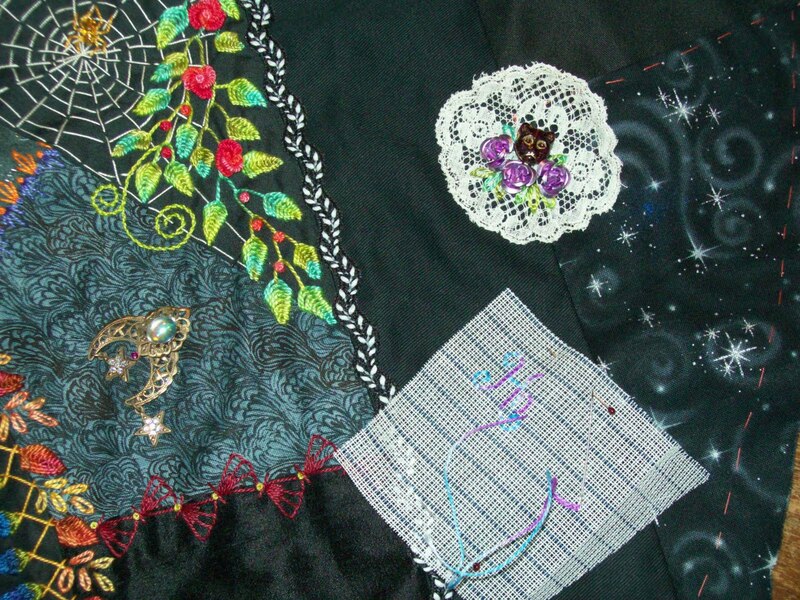 Even though I accidently forgot to bring my sewing bag that contained ALL MY THREADS, EXTRA NEEDLES, AND SCISSORS! When I discovered my error soon after we arrived at the cabin, I didn't panic. I didn't cry. I didn't go upstairs and throw myself down. I didn't rub honey on myself and walk out looking for bears. I didn't go out and tease an elk (though I was sorely tempted to do all those things). I just figured I'd throw myself on the mercy of my fellow CQers and beg a piece of thread here and another there, and I'd stitch as I could, borrowing scissors as I went. 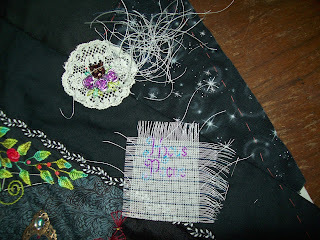 I did have one needle with me, stuck in the cone-shaped piece of the hat, as I'd been working on it when I left and had packed it in the large plastic tub I brought. Well, that first evening, we exchanged our little "gifties" (small tokens for each member of the group; mine was some buttons and beads). Diane M from Ontario gave each of us a small baggie with several skeins of rayon floss (thanks again Diane! ), so I was no longer destitute! The next day, I begged a bit of floss from Gerry H(Gerry, you rock! 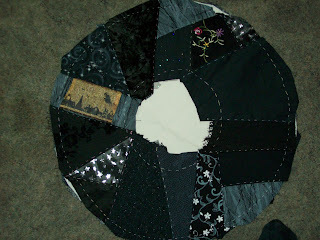 ), and worked on the circle design on my hat. That afternoon, we each got a "door prize", and I got a cute glass jar filled with 6-strand cotton floss. Later I discovered a ball of white perle cotton (my favorite thread) that I'd thrown in for the dyeing session, along with white lace and silk ribbon (for which I had no needle). When we did the dyeing, using Leslie's Adirondack alcohol ink dyes (thank you for sharing again, Leslie, I missed out on this last year), I dyed some of the lace and a bit of the ribbon, but I dyed almost the whole ball of perle cotton (I shared some with others). I did a blue and purple variegation, and a shades of olive green, and shades of grassy green. I did a pale to intense orange, and a pale to bright yellow. I did a white to hot pink that is pretty enough to eat. I did a pink and pale orange that I dubbed "tequila sunrise". Then I got really wild and did a purple and orange variegation specifically for my hat (can't imagine what else that combination would be useful for!). See below; the purple/orange is what I used for the wavy wheat ear chain. The blue/purple is in the "flowers" on the seam to the left of the fly button. The yellow is the broom straw. 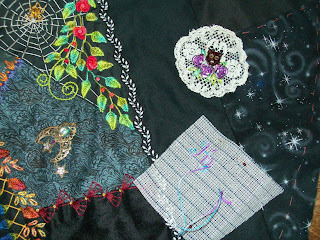 After I got home, I did the "wicked" wording, and put the little glass cat head bead that Gerry gave me on the lace motif with the lavender roses that Ingrid gave me. 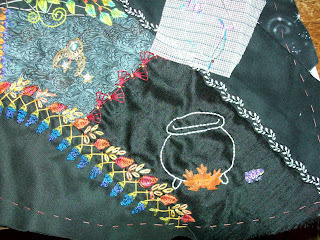 At the retreat I did the backstitched caldron, and gave it some orange leaf beads for its fire. The metal piece to the left is an earring I found at a second hand store. 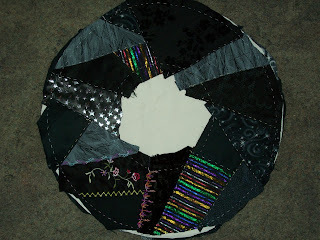 During the stash dash, I found lots of pieces of black fabric to add into my brims, which I hadn't pieced yet. I'd been trying all the week before retreat to find time to piece them, but it was better that I waited till I got there; I got so much more variety in the fabrics by waiting! The bit of orange ribbon is also from Ingrid. I think this brim is the underside, as that large expanse of black fabric is going to have a part of a crocheted doily placed over it as a spider web, with the spider hanging down by a thread. 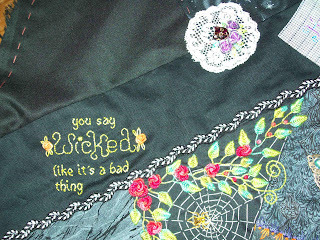 To do the wording, including the "wicked" phrase, I used waste canvas that is made for counted cross stitch. 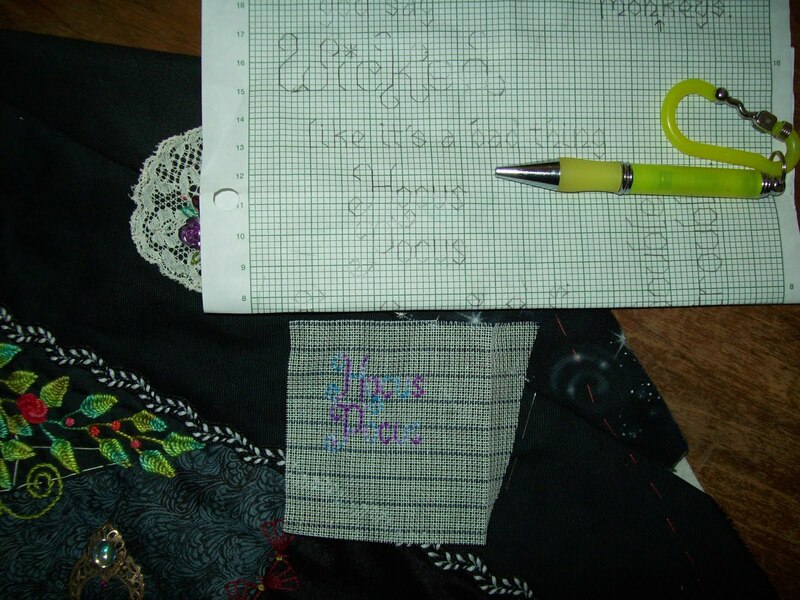 It gives you a grid on which to stitch a motif or words. In this case, "Hocus Pocus". The first thing to do is sketch out the words on graph paper that is approximately the same size as the waste canvas (14 squares to the inch). In this photo, the stitching is already done. 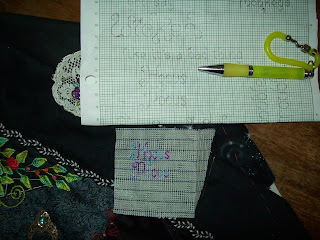 Stitch the wording; I used a back stitch and some of my blue/purple variegated perle. It's good to have large unused margins on the canvas; those long threads are easier to grasp when you start to pull them out. 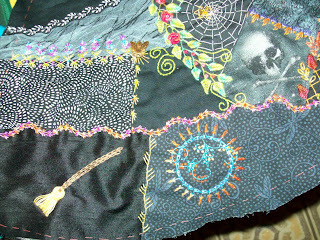 The stitching is done and I'm beginning to take out the waste canvas. This can be done easier if you dampen the canvas, but it's not absolutely necessary. If you're working on satin or other water-stainable fabric, it's best to do it dry. Almost done. 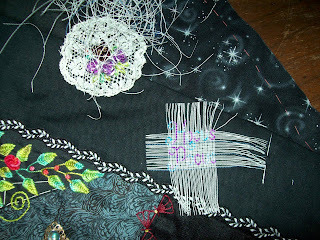 The threads that are actually under your stitches are harder to pull out than the marginal ones, so pull them carefully. Maybe hold a slight pressure on your stitching to keep it in place as you pull. 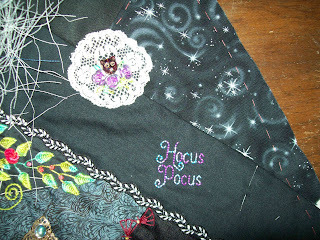 And the finished motif; HOCUS POCUS! Ooops! Did I turn you into a frog? Oh, good! I'm very curious to see how your hat turns out! So far, it looks great, and I'm sure it's going to be fantastic when it's finished! My goodness, your hat is turning out wonderfully! I could see a crazy quilted top hat in my future. Oh, this is a fabulous idea! 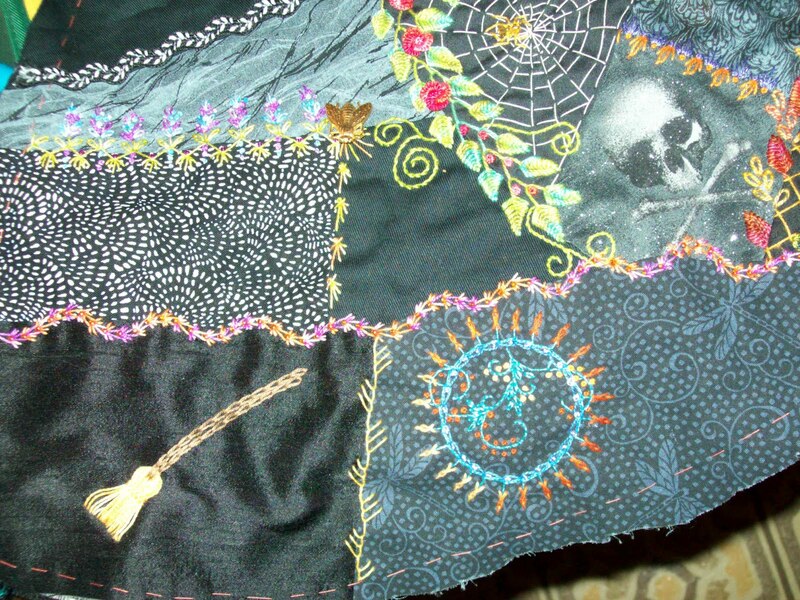 I was just thinking today that I've never done a black crazy quilt. Ooo, now you have me thinking! ha ha. Can't wait for finished photos!